Warm, gooey sticky buns are fantastic—but when you top them with bacon, they're next-level. 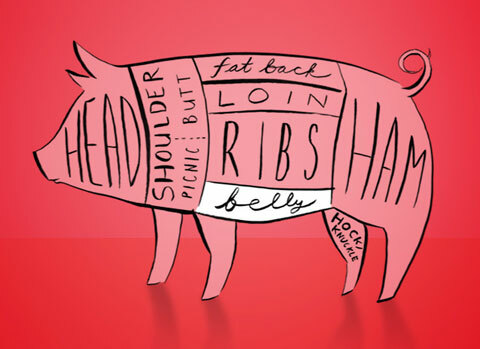 This swinetastic recipe comes courtesy of the I Like Pig cookbook. Each week, we’ll be publishing a recipe from I Like Pig, the official cookbook of New York’s Pig Island festival. Here’s the catch: Each recipe will focus on a different and glorious part of the pig, so you can cook your way through the whole swine. Today’s bacon-topped sticky bun recipe comes courtesy of Pig Mountain’s Heather Carlucci. The following has been excerpted from I Like Pig: Recipes and Inspiration from NYC’s Pig Island (Jimmy Pots and Pans Promotions, 2014) with permission. Heather Carlucci may not be as well-known outside the chef community as many of her contemporaries—she’s been cooking in top city kitchens for 25 years—but she should be. Born and raised in New York City, Carlucci is a badass, one of the founding chefs of New York City’s farm-to-table food movement and one of the first women to lead their own kitchen, the type to work all day every day and still find the time not just to make perhaps the best known dish of Pig Island but run her very own whole pig roast, pigmt.com, each August in Upstate New York. She also co-founded Chefs for the Marcellus, organized to prevent fracking in New York State. Her maple bacon cinnamon buns have been one of the greatest hits of Pig Island for several years running. In a small saucepan, warm the milk over very low heat until it reaches 105°F. Add the yeast and let proof for 10 minutes. Pour into a large mixing bowl or the bowl of a stand mixer fitted with a dough hook. Add the eggs and salt; stir until combined. Add the flour and the butter and continue mixing until the dough is silky and pulls away from the sides of the bowl. Transfer dough to a clean and floured work surface and cut in half. Roll each half into two rectangles 12 inches long, 6 inches wide, and 1/4 inch thick. Sprinkle with the brown sugar and cinnamon, then roll up like a jelly roll and refrigerate. In a small saucepan over high heat, melt remaining 2 tablespoons butter in the maple syrup and bring to a boil. Pour a layer of the resulting glaze 1/8 thick into the bottom of a 10-inch baking pan. Remove the dough from the refrigerator and slice crosswise into 2-inch rounds. Arrange the pieces 1/2 inch apart on the glaze-covered baking pan, then set in a warm place to proof for 20 minutes. Meanwhile, preheat the oven to 350°F. Bake the buns for 25 minutes. While the buns are baking, cook the bacon in a skillet over medium heat until lightly browned but not crispy. Drain on paper towels, cut into small pieces, and add to the saucepan with the rest of the maple glaze. Return the pan to a boil, then remove from the heat and keep warm. When the buns are finished baking, immediately turn them onto a plate so that the glazed sides are facing up. Top each bun with a liberal amount of additional glaze, and serve warm.